This area of our website is still under construction; please check back in March for updated information. 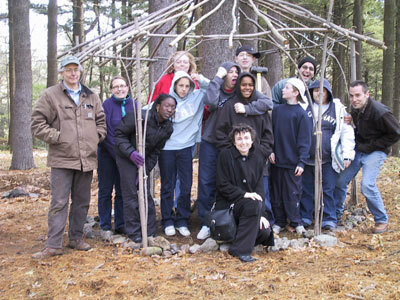 Students from the Little House School in Dorchester spent a week at Forest Hills in May working on an artist-in-residence project with sculptor and woodworker Mitch Ryerson (some of the students, their teachers and the Trust Director Cecily Miller are pictured, with Mitch on the far left). The students learned about the history of Forest Hills and explored the grounds. They constructed two pavilions from branches and saplings gathered from the forested areas on the cemetery's boundaries. As part of the residency, Mitch is also transforming a 10-foot tall maple tree stump into "Opening," a sculptural work which is part shelter and part passageway.